Summary: Learn how to fix a leaking radiator, remove a radiator valve and seal the leak. To fix a leak in the radiator, you must establish the location of the problem. If it is a faulty valve, then you will need to drain the central heating system. Once you have drained the system of water, you need to turn off the supply valve and the lockshield valve. When turning the lockshield valve off, make a note of how many turns it took, so you can re-position it correctly. Place towels under the leaking valve and start to unscrew the union nut connecting the valve to the water pipe. Use an adjustable spanner to do this, whilst holding the body of the valve with another spanner. Open the bleed valve to remove the last of the water from the radiator. Use a bowl to catch the water in. Now tightly wrap the valve tail (starting at the male thread end) with PTFE tape. Overlap each layer by 50%. 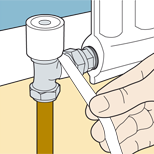 Re-tighten the union valve using the same method you used to unscrew it. Make sure it has been tighten securely. Open the bleed valve along with the supply and lockshield valves. When opening the lockshield valve, make sure you open it as far as it was before by turning it the same number of times as when you closed it. Now re-fill the central heating system. When it has filled, check the radiator valve for leaks before closing the bleed valve. Wrap the male thread of the valve tail tightly with PTFE tape.